The 2007 Mussels of the Month. 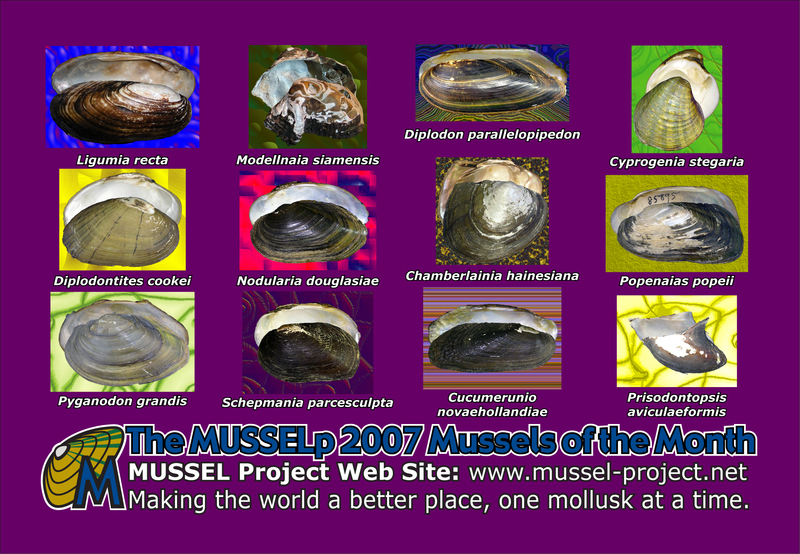 The December 2007 Mussel of the Month is Prisodontopsis aviculaeformis. Prisodontopsis is a monotypic genus endemic to Lake Mweru in southern Africa. Like Lake Tanganyika, Lake Mweru habors some odd, monotypic freshwater mussel genera, and one of them is Prisodontopsis. The shell of Prisodontopsis resembles the Neotropical hyriid genus Prisodon (hence its name), but it is classified as member of the Unionidae based upon soft anatomical characters. However, the only published examination of the anatomy of Prisodontopsis comes from Pain & Woodward's (1968) study of a single, dessicated specimen. We look forward to including the preserved material that we collected earlier this year at Nchelenge in anatomical and molecular studies. The November 2007 Mussel of the Month is Cucumerunio novaehollandiae. As currently recognized, Cucumerunio is a genus of two species, one each on Australia and New Zealand. "This mussel is morphologically distinct from all other Australian species, possessing an elongate-elliptical shell with a distinctive, nodular shell sculpture. Adult shells are large (200 mm) and black, often developing an arched shape with age. Cucumerunio is found in the coastal freshwater rivers and streams of eastern Australia from the Burnett River on the Tropic of Capricorn, and extends south to the tributaries of the Hunter River. It favours fast-flowing, stable environments in gravel-bed streams and is often found in glides at the base of riffles or on the outer bends of streams. Their habitat is often characterised by large boulders that help to stabilise the streambed sediments in the strong flow. Unlike other other Australian species, which reproduce over the warmer months, C. novaehollandiae has a brief, highly synchronised spawning period in autumn and retains its glochidia over the winter months, releasing them in early spring. The glochidia are a distinctive horseshoe shape with two small hooks on each valve, and are much smaller than other Australian mussels." The October 2007 Mussel of the Month is Schepmania parcesculpta. Schepmania is a genus of two species endemic to the island of Borneo in the Indo-Pacific. There is little that can be said about the genus Schepmania. The anatomy of neither species currently assigned to the genus is known. Based upon the lack of data, some have argued that Schepmania might belong to the Margaritiferidae (Bogatov et al., 2003), but we follow Haas in placing it under the Unionidae. However, Haas's conclusions were based entirely on shell characters and geography. The September 2007 Mussel of the Month is Pyganodon grandis. Pyganodon is a widespread genus in North America, extenting from the Arctic south to Mexico. Pyganodon grandis is hands down the most widely distributed freshwater mussel in North America. The species is known from Arctic Canada to Mexico, its range occupying much of the region east of the Rocky Mountains. No mussel gets that far being a specialist, and P. grandis is found in various habitats (from lake to large rivers) and on many different host fish. As a result, it is an extremely variable mollusk, and the current taxonomy of P. grandis incorporates numerous described forms. 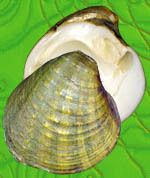 The August 2007 Mussel of the Month is Popenaias popeii. Popenaias is generally a Central American genus found from Honduras north to Texas. Popenaias popeii is the only species of the genus to be found as far north as the United States. The other two species of the genus are known from Mexico and further south in Mesoamerica. In general, Central American species in the Unionidae are currently treated as belonging to genera endemic (13) to that area, but Popenaias is one of the few (5) genera to straddle the Nearctic and Neotropical regions. Other Mesoamerican species have closer affinities to South America and are classified in the family Mycetopodidae. Popenaias is generally similar (shells and soft-parts) to Elliptio, but the former has a distinct breeding period, spawning in the boreal winter rather than the summer. Winter breeding among members of the Pleurobemini caused quite a problem for early classifications that relied heavily on the "brooding period" as a taxonomic character. The July 2007 Mussel of the Month is Chamberlainia hainesiana. Chamberlaindia is a genus of two species known from Thailand and Laos in Indochina. The genus is of some economic importance because of its utility to the pearl industry. However, from a taxonomic/systematic standpoint, we don't really have too much to say about Chamberlainia. From Brandt (1974), we know that C. hainesiana has unhooked glochidia, and thus it can only be placed in the poorly-known hodge-podge of species and genera that seem to form a grade at the base of the Unionidae branch. The June 2007 Mussel of the Month is Nodularia douglasiae. As we currently treat it, Nodularia is a genus of four species occurring from the Russian Far East south into Indochina. The taxonomy of Nodularia douglasiae is representative of an on-going disagreement that has clouded the literature on Palearctic freshwater mussels for the last thirty years. For example, according to Fritz Haas (1969), Nodularia douglasiae is a single widespread species with seven subspecies distributed from the Amur Basin and the Russian Far East, to Japan, Korea, China and Taiwan. However, recent treatments by Russian followers of the "Comparatory" Method treat the Russian populations as no fewer than ten distinct species (e.g. Starobogatov et al., 2004). The Comparatory Method, as it is applied in the modern malacological literature, is a typological species concept, in contrast to other species concepts that treat species as evolutionary lineages. Unfortunately, this dichotomy in philosophy and methodology provides two extreme views: there are either 45 Biological Palearctic species of freshwater mussels or 156 Comparatory species. We estimate that the true value will be found to be somewhere between those two values (although probably much closer to 45 than 156). The May 2007 Mussel of the Month is Diplodontites cookei. There are only three species of Diplodontites, and they are all known from a small area of northwestern South America. Little can be said definitivelyabout Diplodontites except that it is a unique genus. Based upon the morphology of the hinge teeth, it seems to be part of the subfamily Monocondylaeinae. However, we know little if nothing about its soft-anatomy. One of the most interesting things that we know about Diplodontites is that while all three species in the genus occur west of the Andes in Colombia, D. cookei is also known from the upper Amazon in Peru. That is a significant disjunction, given the appareny biogeographical barrier presented by the mountains. The April 2007 Mussel of the Month is Cyprogenia stegaria. Cyprogenia is an interesting Nearctic genus of two species: one from the Ozark Region west of the Mississippi, and the other from the Ohio Basin including the Cumberland Plateau. Cyprogenia belongs to a group of freshwater mussels known as the lampsilines, which are endemic to North and Central America. Other lampsilines that have been featured as Mussel of the Month to-date include Lampsilis, Ptychobranchus, Hamiota, Potamilus and Ligumia. Among the characteristics that distinguish lampsilines from other freshwater mussels is the tendency to modify a portion of the ctenidia (gills) for brooding. Typically the typical freshwater mussel life cycle involves parental care. Female mussels  rather than casting their gametes to the water to be fertilized externally like so many marine bivalvies  brood their ova and developing embryos in "marsupia" derived from modifications of their ctenidial demibranchs. In Cyprogenia, these modifications involve a large, coiled elaboration of the demibranchs. These elongate marsupial "tubes" serve the next stage in the freshwater mussel life cycle: parasitism upon freshwater fishes. The spaces of the marsupium serve as molds for packaging the parasitic larvae. Cyprogenia larvae are packaged to look like elongate worms  a known favorite food of fish. The fish takes the bait and ends up facilitating the next generation of Cyprogenia! There are excellent pictures of the larvae of C. aberti (a closely related species) on Chris Barnhart's Unio Gallery. The March 2007 Mussel of the Month is Diplodon parallelopipedon. Diplodon is a relatively diverse genus in the family Hyriidae, found throughout South America east of the Andes. In the realm of rational discourse, there are few quagmires as deep as Diplodon. Both Parodiz (1968) and Haas (1969) tried to make sense of the species diversity, but there was very little agreement between their two systems. At least they agreed that their was a "Diplodon": Modell (1950) had taken some diplodons and arranged them with Castalia. More recently, Simone (2006) has advocated splitting the diplodons into two genera: Diplodon and Rhipidodonta. There is still a lot of work to do on the systematics of Neotropical freshwater mussels. 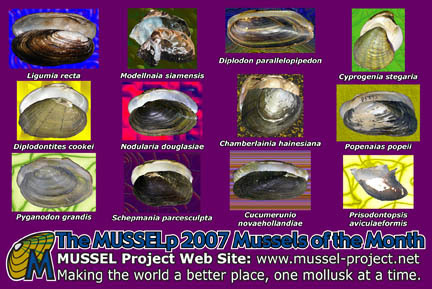 The February 2007 Mussel of the Month is Modellnaia siamensis. Modellnaia is an odd little monotypic genus of unionid endemic to the Mun River in Thailand. Modellnaia siamensis is ad odd freshwater mussel. It behaves a bit like it belongs among the cementing Etheriidae, but, based upon its anatomy, Modellnaia belongs to the Unionidae. It has recently been argued that cementing and shell asymmetry has evolved multiple times among the Unionoida. Modellnaia is the only known example among the Unionoidea. The January 2007 Mussel of the Month is Ligumia recta. Ligumia is a widespread genus of three species inhabiting much of eastern North America. Ligumia species are recognized by their elongate shells and distinctive mantle elaborations. Simimlar to other lampsiline freshwater mussels, the posterior mantle ventral to the incurrent aperture is adorned with a series of papillae. These have been hypothesized to carry out various functions, including brood aeration and host fish attraction. 2007 MUSSELp Mussels of the Month Postcard.